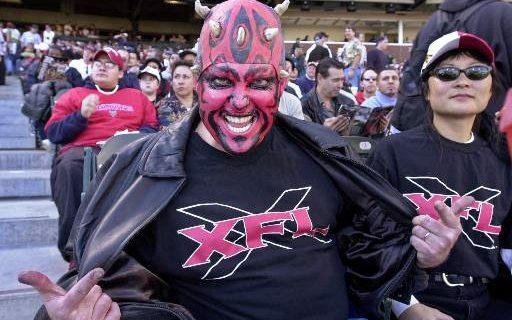 Last week, World Wrestling Entertainment’s Vince McMahon announced the XFL will return. What kind of cutting-edge innovations can fans expect from the new league? Sports comedian Jeff Wozer has some ideas. • Fifteen yard penalty for hitting a quarterback with a folding chair. • Two points for any player who tackles using the airplane spin. • Each team must have at least one out-of-control player from, or allegedly from, Samoa. • Backup players can’t enter game until tagging the hand of the injured player they’re replacing. • Pay-per-view inside sideline medical examination tents. • The Royal Fumble – all 8 teams play on the same field at the same time. • Touchdowns missed by referees distracted by staged brawls cannot be reviewed. Jeff also wondered how it would be different if Jon Bon Jovi had actually bought the Bills.